The very earliest paintings, those found in caves throughout the world, and many dating from more than 10,000 years ago, can appear to record events which could, in places, amount to narrative. Although many are strongly figurative, their interpretation is difficult, and it is hard to be sure whether any are truly narrative. The oldest paintings which can be reliably interpreted as being narrative are those of the ancient Egyptians. By about 1300 BC there were many good examples of stories being told through paintings on various supports, most clearly the Books of the Dead which accompanied their burials. Unknown, The Weighing of the Heart from the Book of the Dead of Ani (c 1300 BCE), The British Museum, London. Wikimedia Commons. The Weighing of the Heart from the Book of the Dead of Ani (c 1300 BCE), now in The British Museum is one of the clearest examples. In the lower tier of images, the painting is read from the left. It first shows Ani and his wife Tutu entering the assembly of the gods. 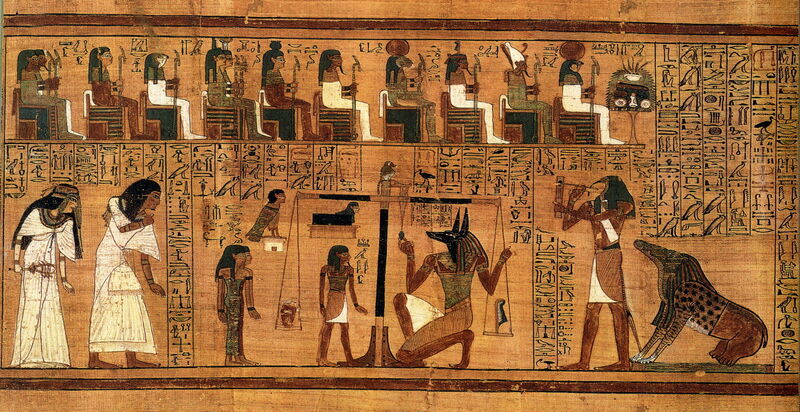 The centre section shows the god Anubis weighing Ani’s heart against the feather of Maat; should his heart be heavier, then he will not be admitted to heaven. This procedure is observed by the goddesses Renenutet and Meshkenet, the god Shay, and his own ba. The right section of the lower tier shows the monster Ammut, who is poised to devour Ani’s soul if his heart were to prove heavy, hence unworthy of heaven. Thoth is there to record the outcome. The upper tier shows the other gods in oversight. Other Egyptian paintings depict action such as wrestling, juggling, and hunting by means of multiple images, normally read from left to right too. Unfortunately the many wall paintings of the ancient Greek and other pre-Roman civilisations in the Mediterranean have largely been lost, although written accounts attest the importance of narrative paintings of historical events to the Greeks. One of the few to have survived intact is from the Cycladic civilisation on the Greek island of Santorini (Thera), which was destroyed by a huge volcanic eruption in about 1627 BC, engulfing the buildings and preserving them much in the way that Pompeii was. We can therefore be confident that its wall paintings were completed before that date. The Flotilla Fresco (or Frieze) is a panorama showing a flotilla of boats making their way from one port to another. Although it is not certain, it appears likely that the individual vessels are shown more than once in the same image, combining two or more moments during the story into a single composite image. Over a millenium later, but still well before the earliest Roman paintings, the Etruscan civilisation left many tombs with extensive wall paintings. One of the better examples is from the site known as the François Tomb at Vulci, on the coast to the northwest of Rome, Italy. Unknown, Liberation of Caelius Vibenna (c 340 BCE), the François Tomb at Vulci, moved to Villa Torlonia già Albani, Rome. Wikimedia Commons. The Liberation of Caelius Vibenna (c 340 BCE) shows a sequence of what are presumed to be historical events involving the liberation of Caelius Vibenna by Macstrna (identified as Servio Tullio) at the left. In the centre, Larth Ulhtes kills Laris Papathnas Velznach, of the Volsinii tribe. To the right of that are further killings, in each case their names inscribed above the figures. 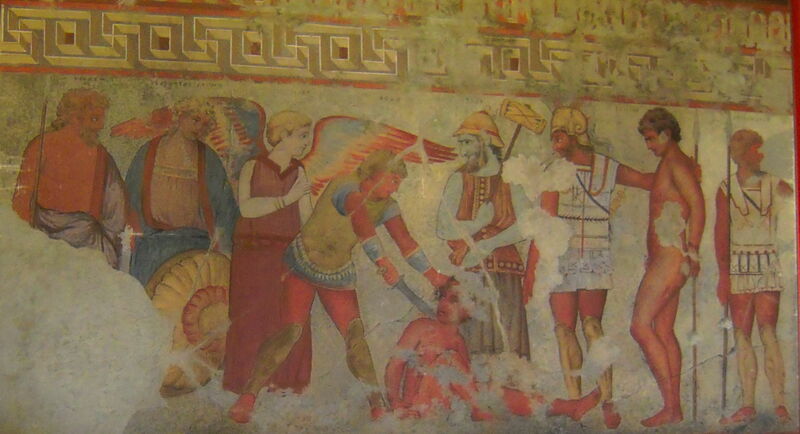 Other paintings in the same tomb depict the sacrifice of Trojan prisoners, accompanied by one of the earliest depictions of a winged ‘angel’. There are far more extensive paintings which have survived from the Roman civilisation, particularly those from the city of Pompeii which were buried during a catastrophic eruption of Mount Vesuvius in 79 CE. 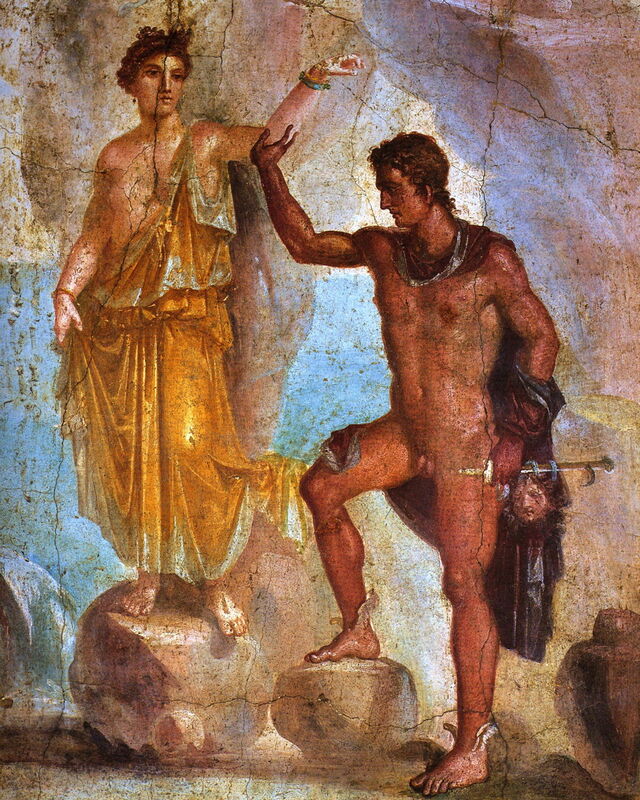 Unknown, Dionysian Rites (before 65 CE), Room 5, Villa of the Mysteries, Pompeii, Italy. By WolfgangRieger, via Wikimedia Commons. Among the most spectacular are the wall-paintings in the Villa of the Mysteries in Pompeii, showing Dionysian Rites from before about 62 CE. Room 5 contains a frieze of 29 figures at nearly life size, which appear to depict a sequence of ritual events involving a mixture of Pompeiians and deities. Myths were also a popular subject for Roman artists. Unknown, Dido and Aeneas (Venus and Mars) (c 10 BCE – 45 CE), Casa del Citarista (I, 4, 25), Pompeii, moved to Museo Archeologico Nazionale di Napoli, Naples. By Stefano Bolognini, via Wikimedia Commons. 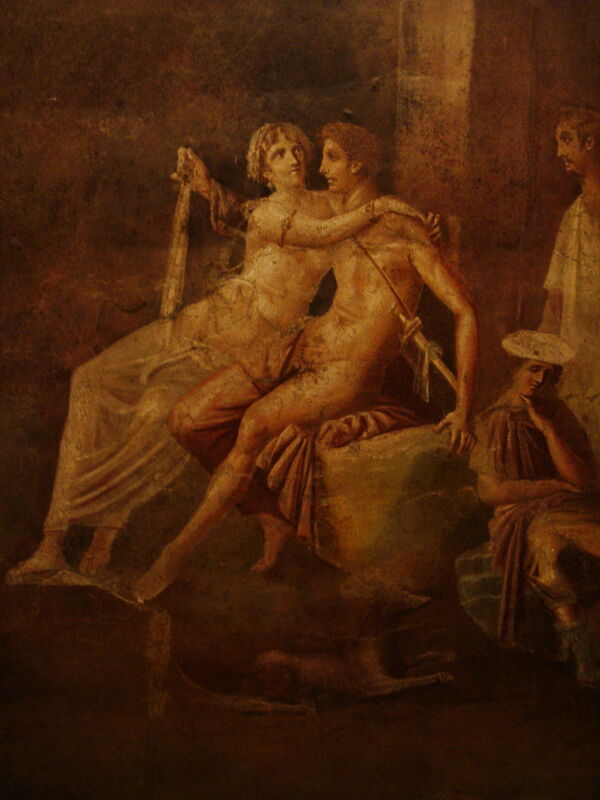 These could be simple images, such as that of Dido and Aeneas, or possibly Venus and Mars, (c 10 BCE – 45 CE) making love. 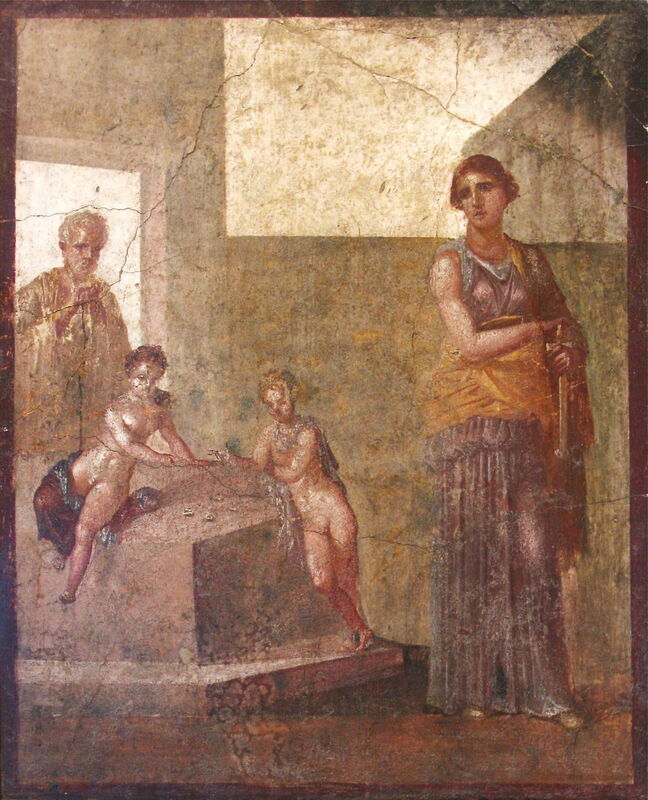 Unknown, Medea Planning the Murder of her Children (c 50-75 CE), Casa dei Dioscuri, Pompeii, moved to Museo Archeologico Nazionale di Napoli, Naples. By Olivierw, via Wikimedia Commons. Medea Planning the Murder of her Children (c 50-75 CE) is slightly more sophisticated, showing Medea preparing to kill her two children as vengeance for Jason abandoning her to marry the King of Corinth’s daughter, Glauce. This was a variant of the story of Medea told in Euripides’ play Medea. The children are shown playing the popular game of knucklebones. The story of Perseus and Andromeda appears to have been popular in paintings, with several examples known. This version from Boscotrecase, near the coast at Pompeii, dates from soon after 11 BCE, and puts the story into a larger landscape, much in the way that later landscape painters such as Poussin were to do. I have detailed the full story here, but for the purposes of this article will summarise this section of it. The daughter of the King of Aethiopia and his wife Cassiopeia is very beautiful, but her mother boasts openly of her beauty and incurs the wrath of Poseidon. The latter sends Cetus, a sea monster, to ravage the Aethiopian coast, and Cetus can only be sated by chaining Andromeda to a rock on the coast, to leave her to be devoured by the monster. As she awaits her death, Perseus flies past, returning from cutting Medusa’s head off. He spots Andromeda, frees her, and kills Cetus. Andromeda is shown in the centre, on a small pedestal in the rock. 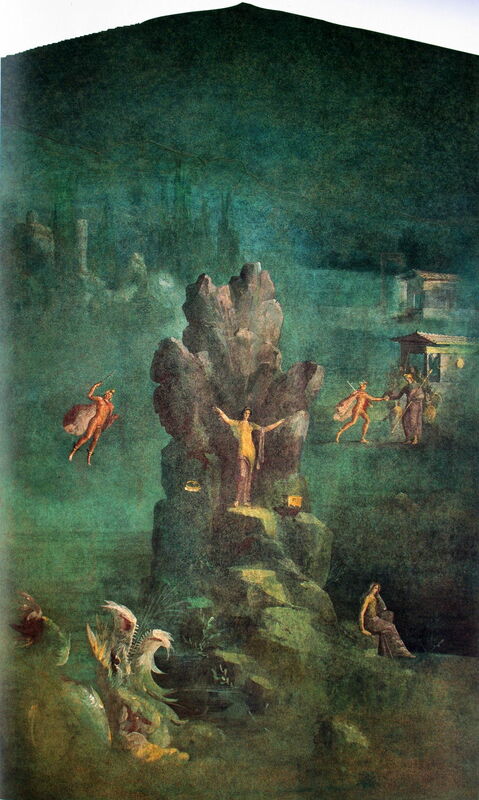 Below it and to the left, the gaping mouth of Cetus is shown, as Perseus flies down from the left to rescue Andromeda, kill the sea-monster Cetus, and later marry Andromeda in reward, as shown on the right side of the painting. As with many later paintings, this sophisticated image shows a composite of at least two episodes in the story, and contains two separate versions of both Perseus and Andromeda. This slightly later version, Perseus Freeing Andromeda (c 50-75 CE), adopts an approach more typical of very much later artists, showing a close-up of the couple. Andromeda is still chained to the rock by her left wrist, and is partially clad rather than naked as the myth related. Perseus has Medusa’s head tucked behind him, the face shown for ease of recognition. He is wearing his winged sandals, and carrying his sword in his left hand. There is no sign of Cetus, though. Neither face shows anything other than a neutral expression. Their body language is limited too, and Perseus’ right hand in an unnatural position. However, it is not far from the best of the great Masters who were to come more than 1500 years later. Narrative painting was an important, and at times the dominant, genre from the earliest paintings which we can read today. Although later techniques such as expression of emotion in the face, and clear body language, had yet to develop, the skills of the Roman painters two millenia ago were effective, and well on their way to later sophistication. Haynes S (2000) Etruscan Civilization, A Cultural History, J Paul Getty Museum. ISBN 978 0 89236 600 2. Ling R (2012) Roman Painting, 2nd edn, Cambridge UP. ISBN 978 0 521 31595 1. Pappalardo U (2008) The Splendor of Roman Wall Painting, J Paul Getty Museum. ISBN 978 0 89236 958 4. Pollitt JJ (2014) The Cambridge History of Painting in the Classical World, Cambridge UP. ISBN 978 0 521 86591 3. Tiradritti F (2008) Egyptian Wall Painting, Abbeville Press. ISBN 978 0 7892 1005 0. Posted in General, Painting and tagged Andromeda, Egypt, Etruscan, Italy, narrative, painting, Perseus, Pompeii, Roman, Thera. Bookmark the permalink.